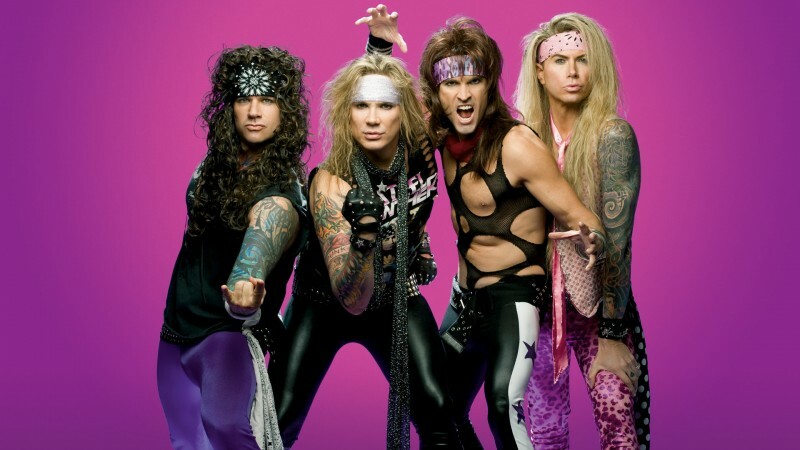 This… is… ah… Steel Panther. If you think this is some kind of a joke… you are correct. It is. But a very talented, fun, everyone is invited to laugh along kind of joke that has worked itself into a nice career for the boys in Steel Panther. The band gained its popularity playing gigs along the Sunset Strip in the early 2000’s, originally under the moniker of Metal Shop (soon changed to Metal Skool, then finally landing on Steel Panther… because… why not?) at notorious scenester dens like The Viper Room and The Key Club. The intention was both to pay tribute to the musical style, while poking some fun at the more ridiculous end of the fashion spectrum that came with the 80’s glam rock scene. Success came in strange doses… such as appearing in a Discover Card commercial as ‘Danger Kitty’. The band has a new feature full length DVD/CD being released at the end of February 2016 called, “Live from Lexxi’s Mom’s Garage” and features 10 acoustic numbers of their most popular songs mixed in with comedic skits from the band. A video for, “The Burden of Being Wonderful” has been released to give folks a taste of some Steel Panther. And here is a song that makes the world a better place just because of it’s sheer existence.